2018 Australian Alternative Varieties Wine Show. The 2018 Australian Alternative Varieties Wine Show is held during the first week of November each year in Mildura, Victoria. 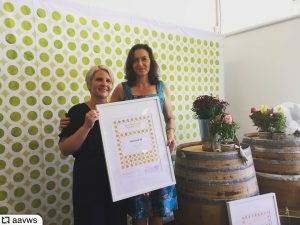 The 2018 Show saw 805 entries received from 207 exhibitors, from 62 wine regions across Australia, and encompassed 101 unique grape varieties. The show is more than a forum for wines that fall outside the mainstream. It encourages cutting-edge judging procedures and provides a host of social and educational events that promote the sharing of knowledge and ideas of the lesser known grapes. This is the first vintage of this wine for Vineyard 28. Dolcetto is a black Italian grape variety, known for its low levels of acidity and tendency to be ready for an early harvest. This fruit is grown at the Wildwater Vineyard site in the hills behind Harvey. Full of flavours and vibrant with red berry fruit, sarsparilla, hints of rosewater, grainy herbs, cedar and spices, a wine that is drinking well whilst young and fresh. Meg Kopke receiving the award on behalf of Vineyard 28, from sponsor CHR Hansen. Winemaker, Mark Cumbers was ‘over the moon‘ when he received the call to advise he’d received a Trophy for the Dolcetto. Thank you to our colleague Meg Kopke who was attending the Awards Long Lunch this year, and accepted the trophy on our behalf. Receiving this Trophy is great recognition for being one of the Geographe Wine Region’s pioneers of the lesser known grape varieties.